EXECUTIVE SUMMARY: Now that Donald Trump has exited the 2015 JCPOA nuclear deal with Iran, there is more at stake for the other signatories than either their belief in the deal’s virtues or their eagerness to salvage economic opportunities. Maintaining the deal without the US would deliver a severe blow to American credibility and perceptions of US power. China has long experience circumventing sanctions regimes, but the environment surrounding the reimposed sanctions is likely to be unusually confrontational. Chinese businessman Sheng Kuan Li didn’t worry about sanctions when he decided in 2010 to invest $200 million in a steel mill in Iran. That mill started producing ingots and billet within months of the lifting of punitive measures against the Islamic Republic as part of the 2015 international nuclear agreement with Iran. As he had no operations in the US, Li was not concerned about being targeted by the US Treasury. Moreover, he circumvented financial restrictions on Iran by funding the investment through what he called a "private transfer," a money swap based on trust that avoided regular banking channels. In doing this, Li was following the standard Chinese practice of evading the sanctions regime by using alternative routes or establishing alternative institutions that are in effect immune. In another example, Beijing established the Bank of Kunlun in order to continue to purchase Iranian oil while sanctions were in place. The Chinese experience in circumventing earlier sanctions will come in handy once again. By walking away from the 2015 JCPOA agreement and reintroducing punitive economic measures, US President Donald J. Trump is now making a renewed effort to isolate Iran and force it to make further concessions on its nuclear and ballistic missiles programs as well as its regional role in the Middle East. Beijing has rejected these steps. Chinese foreign ministry spokesman Geng Shuang said in response to Trump’s announcement that the People’s Republic remains committed to the deal and will "maintain communication with all parties and continue to protect and execute the agreement fully." Beijing’s likely willingness to circumvent US sanctions is one factor that will influence Iran’s decision on whether it will stick to the agreement. Iran’s decision will also depend on the readiness and ability of the other signatories – Britain, France, Germany, and Russia – to stand up to the US. Europe, like China, has rejected Trump’s move and vows to ignore the sanctions. It will, therefore, need to find ways of shielding European companies from potential US punitive action. One possibility would be to use alternative Chinese financial networks. However, this time around, rejecting and violating US sanctions may prove – for China as well as the other signatories – to be a trickier undertaking. Last time, Beijing and the other signatories were part of an international consensus that aimed at forcing Tehran to accept restrictions on its nuclear program, even if they at times circumvented the sanctions. China and the other signatories are now likely to be operating in a far more confrontational environment. The subtext of Trump’s decision, as well the position of Saudi Arabia and Israel, appears to be a policy that seeks to achieve regime change in Tehran. Riyadh and the United Arab Emirates recently suggested that they are willing to quietly sanction those who fail to support them in their 11-month-old economic and diplomatic boycott of Qatar. There is little reason to doubt that they would do the same in their confrontation with Iran. Saudi Crown Prince Muhammad bin Salman has, after all, described the dispute with Qatar as "trivial" in comparison to the kingdom’s existential battle with the Islamic Republic. Saudi Arabia demonstrated its assertiveness by forcing major multinational financial institutions to choose sides in the Gulf spat. In response to Saudi pressure, JP Morgan and HSBC walked away last month from a $12 billion bond sale. Earlier, Doha Bank, Qatar’s fifth-biggest lender, was forced to reduce the size of a two-year, $575 million bank loan that it had raised in December 2015 to $400 million. It did this because when it sought a one-year extension of the facility, Chinese, Hong Kong, and Japanese banks opted not to participate. 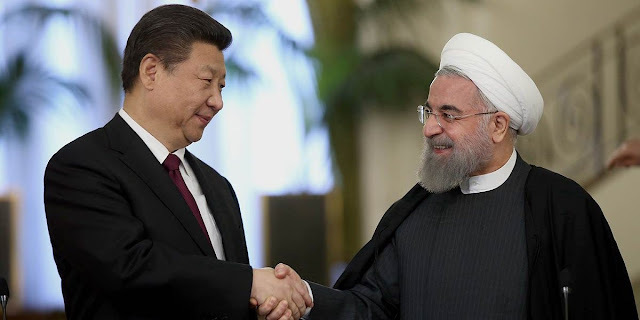 In Beijing’s case, its concerted effort to remain above the fray of the Middle East’s multiple conflicts could be severely compromised if it was forced to take sides in a conflict between Iran, a country with which Beijing feels it has much in common and that it has assisted in developing its ballistic and nuclear programs, and Riyadh, a newer friend that is economically important to the People’s Republic. To be sure, greater Saudi assertiveness does not mean that the kingdom does not have to tread carefully in seeking to penalize China and others for their potential refusal to go along with Trump’s confronting of Iran. Saudi Arabia desperately needs foreign investment to implement Prince Muhammad’s Vision 2030, a far-reaching plan for social and economic reform that aims to diversify the kingdom’s conservative society and oil-dependent economy and turn it into the 21st century, knowledge-based state. China, moreover, is one of Saudi Arabia’s foremost oil export markets. While the Saudi military remains focused on US and European arms purchases, Beijing – at a time when a military confrontation between the kingdom and Iran is not beyond the realm of the possible – is a source of weaponry the US has been unwilling to sell to Saudis so far. With Washington refusing to share its most advanced drone technology, Beijing agreed last year to open its first overseas defense production facility in Saudi Arabia. State-owned China Aerospace Science and Technology Corporation (CASC) will manufacture its CH-4 Caihong, or Rainbow drone, as well as associated equipment in Saudi Arabia. The CH-4 is comparable to the US armed MQ-9 Reaper drone. The stakes in the battle to save the Iranian nuclear deal in the wake of Trump’s decision go far beyond either a belief that the deal is serving its purpose of curbing potential Iranian nuclear ambitions or a desire to pursue economic opportunity. Leveraging its experience, an effort by China together with Russia and Europe that keeps the Iranian nuclear deal in place and thwarts US sanctions would deliver one of the heaviest body blows to US credibility and perceptions of US power since Trump came to office in January of last year. Said a Middle Eastern diplomat: "A successful countering of US sanctions would demonstrate beyond doubt limits to America’s ability to impose its will. That would have wide-reaching consequences, not in the least question marks in Saudi Arabia and Israel on the degree to which they can risk continuing putting most of their eggs in Washington’s basket." Publication Details: This article was first published at BESA Center Website as Perspectives Paper No. 839 on May 18, 2018, and is republished on IndraStra.com with Original Publisher's Permission. All Rights Reserved by BESA Center.